Welcome to AGNRG.com — where we focus on cellular energy! By adding our product, CN (short for Cellular Nutrition), an animal is able to heal itself AS NEVER BEFORE. This is due to a large increase in net cellular mitochondrial ATP energy resulting from CN. 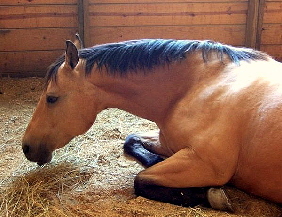 An animal uses the increased energy to heal 24 hours a day, instead of only while sleeping. With all forms of life, health begins in the energy production systems of the cell (the mitochondria) — as that energy production goes — so goes the life of the entire organism, including healing, reproduction, work. Everything depends on energy! Think about what treatment modalities can be called upon to help an animal to get through an illness or injury… antibiotics and steroids, or surgery, or perhaps chemo? That’s about it... and all of those solutions are guaranteed to shorten the animal’s life. And what about for a healthy animal... What is available to ensure that it has peak mental capacity, peak stamina and can withstand virtually any amount of physical stress, including toxins... answer: very little that makes any real difference? Cellular Nutrition is an exciting arrival on the animal husbandry scene. It completely changes the landscape of helping your animal heal, recover and perform in an improved way. It has to do with cellular energy enhancement... something different than just nutrition. Equine CN changes hair, coat, the way they feel and overall health. I have been using and recommending the Equine CN formula for two years. In my twenty years as an equine therapist I have not seen a product work so fast and so well as Equine CN. 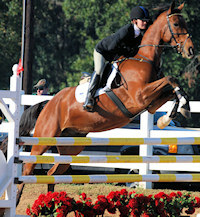 I have noticed a definite improvement how well my horses recover after the cross country since we started using Equine CN. The most significant thing for me was being on Equine CN, he gained weight while spelling after the Nationals which he does not normally do. If you have a horse with muscle problems - especially 'tying up' - I have found Equine CN the best product I have ever tried. Flo had hoof problems because she had no heel; we tried everything for three years to get her to grow some heel, to no avail. After 4 weeks on Equine CN the farrier noticed NEW heel growth!! I had taken a number of our horses off CN (because of the cost) and went back to using the Cortaflex Products (a joint product) to help with soreness etc but after two months the horses are running like crap and are not as well... I feel they have more soreness issues after hard runs. I have realized CN is not expensive at all and they will not go off CN again. Click here to see many more testimonials about the power of CN in recovering and healing of animals. The reason that CN can help is because it creates surplus cellular power... ordinarily the only time than cells have surplus power is during sleep when other operations slow down. Then that surplus power is used for healing. Two methods exist for creating surplus cellular power in your animal. The first is for your animal to sleep more — reducing cellular energy requirements to a minimum during sleep, so that there will be excess energy available in the cells that can be tapped by healing processes. Of course, it is difficult to force an animal to sleep more. The only other viable option is CN. That’s why our breakthrough product CN is so important in allowing animals to heal as rapidly as possible from injury or disease, or to function at peak performance longer and recover from overexertion. CN (short for Cellular Nutrition) is a true Super Food...one that excels all other foods on earth in terms of increasing power output from the cellular mitochondria (they are the power producing organelles of a cell). Try it for yourself – if you have an animal that is having acute or chronic challenges that are NOT seeing resolution – give CN a 30 day test! Give your animal the energy and strength to have the healing, stamina and even fun it could have.